Bread naturally molds. The only thing that will slow that process down is some kind of preservative. The best all-natural preservative is called refrigeration. Refrigeration has a bad reputation among some bakers and bread aficionados. The reason for this is that a refrigerator is also, in part, a dehydrator. It must maintain a very low humidity in order to keep the temperature low. So in most places, bread in the fridge equals dry bread. However, here in southwest Colorado, our ambient humidity is already extremely low. During most times of the year, your refrigerator will actually have an equal or higher relative humidity than your countertop. So try storing your “Durango bread” in the refrigerator and see what you think. At home, our family is able to keep bread on hand, fresh, and ready to eat, for up to ten days in our fridge. Any of our bread products can be frozen. Did you know that most of the “grocery store bread” has already been frozen, often for many months? Especially the natural brands (which cannot use the chemical additives necessary for an extended shelf life) are baked and then flash-frozen and shipped in refrigerated trucks… It is kind of a silly waste of resources, isn’t it? 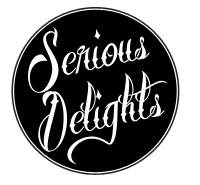 At Serious Delights, we are happy to bake your bread fresh every day. But you can certainly freeze our bread! It’s never been frozen (unless you bought a specialty loaf from our freezer!) and it will handle the process with grace and dignity. One of the best uses of this is to stock up on day old bread and freeze it for later use. Our day old bread is only $2.50 each, when you buy two loaves! Reheating bread is a simple, effective way to refresh its quality. Take our unsliced breads from your freezer, remove the bag, and run the whole loaf under water for a moment. Put it in a 350 degree oven for 20 minutes, and it will be amazing, suitable for the finest meal. For sliced breads, you are limited to grilling or toasting, but the end result will again be fabulous!